Q. How is a micro-motor carver different from a rotary tool such as a Dremel? A. Micro-motor carvers have a flexible cord instead of using a flexshaft, making the handpiece easier to maneuver amd more comfortable to hold. A Dremel tool is heavy, and heat from the motor will become uncomfortable very quickly. Even with an added flexshaft, a Dremel tool is cumbersome in comparison to a micromotor handpiece and cord. Miicromotor tools have a bit less power than a Dremel, but they have more speed. 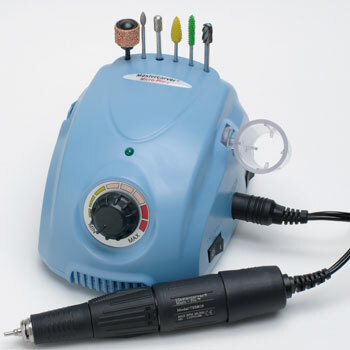 Q: Can I still use the burs that I already bought for my Dremel tool? Q: Do I need a tool hanger? A: No - these tools have a base unit that sits on the tabletop (or clips on your belt in the case of the portable micromotor tool). They have an attached tool holster or a tabletop stand for the handpiece. The base unit is small and compact and easy to transport for use in classes. Q: Is this tool powerful enough to carve gourds? A: While the micromotor carvers have slightly less power than heftier rotary tools, it is more than adequate for gourd carving. When using large headed burs, the tool may be strained by heavy duty carving. The tool will automatically switch off if you overload it, but can be reset and run as normal after a short cooling off period. Try to avoid excessive "lugging down". Use lighter pressure. Q: I have arthritic hands and my hands are small. Will this tool work for me? A: The true advantage of this type of tool is the lightweight handpiece and flexible cord. These features allow you to hold the tool comfortably for an extended period of time. The handpiece and flex cord make it possible to do hours of carving with less hand fatigue. *Below are selected portions from a tool review I wrote for the May 2012 Arizona Gourds newsletter. Please note that this review was written as an unpaid and unsolicited review. It was my findings from this review that made me decide to offer the Micro-Pro Champion on my site. 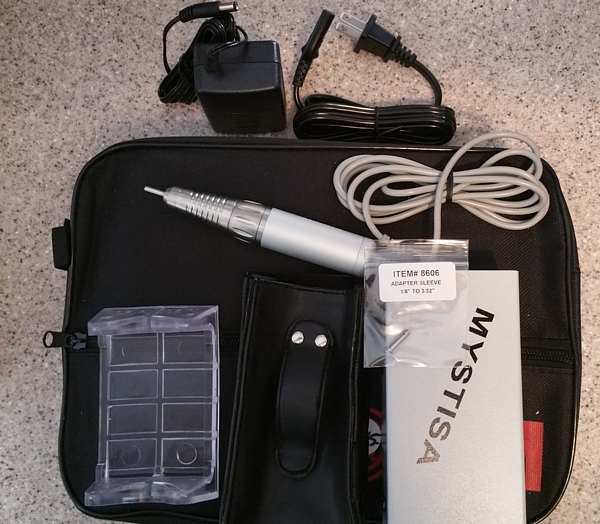 I've owned a Mastercarver micromotor tool for several years. Because micromotors inherently have less power than Dremel and Foredom tools, I've used mine primarily for things like filigree hole carving, where the handpiece and soft, flexible cord is easier to hold when using the tool in a vertical position. I recently bought the newest Mastercarver tool that advertises that it has more torque than their older models. I also had a chance to compare a competitor's tool and an older model Mastercaver. My original older model Mastercarver Micro-Pro is about 4 or 5 years old, and is a nice tool with a relatively lightweight handpiece that is is easy to hold. (I often suggest micromotor tools to ladies that have small hands or little hand strength, or only do light duty carving.) The tool has good speed, but lugs down under heavy pressure, especially when using burs with large heads. When the tool "lugs down" you need to ease off on the carving to avoid overloading the tool. It's lightweight and compact - but it's a precision instrument and must be taken care of to keep the handpiece operating correctly. Best use for this tool is detail carving, it's not ideal for general use. I also tried a competitor's micromotor tool (see full review in newsletter for details) which performed similarly to my older Micro-Pro, but had a little less power. It tended to lug down even while using smaller burs. I tested two units owned by two different people, and both performed in a similar manner. The tool was advertised as running at up to 46,000 RPM, but the handpieces on both units were clearly marked as being rated for 35,000 RPM. Compare Micro-Motor Tools Grinders / Carvers based on quality, features and value: The MICRO-PRO by MASTERCARVER® High-Performance Tools wins Micro-Motor Tool comparisons to: FOREDOM, RAM, TPS, NSK, Gourd Master and more! Compare component quality: The Micro-Pro features top quality components like NSK bearings and CNC manufactured high precision stainless steel collets. Compare Micro-Motor Tool Grinder warranties: the Micro-Pro covers the handpiece and control box for 1-full year. The new Micro-Pro Champion features an 11% increase in torque (power) from their previous models. With higher torque & speed up to 46,000 rpm, the Micro-ProTM has the power, speed, superior features & quality you want, priced far less than others! For better control, power flows to the handpiece by a 6’ flexible cord. The dial varies speed from 0 to 46,000 rpm! Control box features: dial speed control knob, lighted power indicator, on/off switch, overload protection, 6-burr storage holes, 110/220 Volt selector, forward/reverse switch (directs chips away from you or for left-handed carvers). Handpiece features high torque, fan cooled micro motor, sealed NSK ball bearings, solid grip turn-ring for hands-free bit changes (1/4 turn releases or locks bits & collets). 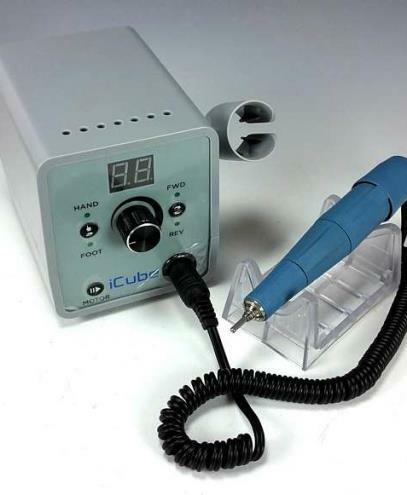 Handpiece specifications 46,000 rpm: L. 6”, diameter 5/8”-1”, weight: 7.3 oz. Set includes: handpiece, 3/32” & 1/8” quick change collets, variable speed power supply, table top and box mounted handpiece holders, long-life motor brushes, instructions & 1-year warranty. Note: Burs not included. 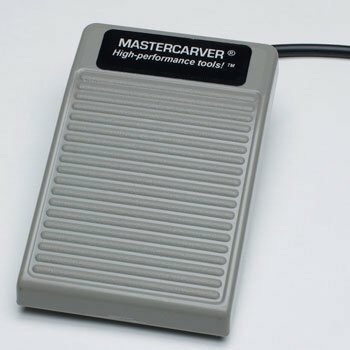 For hands-free control add optional on/off foot pedal. These adapters slide into 1/8" collets to allow them to accept 3/32" or 1/16" shank accessories. A 3/32" adapter comes with each tool. They may be used in any brand of micro motor handpieces, or even in Dremel type tools. There are several micromotor options - read below to find out which one is best for you. Basic repair parts such as replacement switches, handpiece bearings and wrenches are available by special order. This carver is designed for portability and versatility. You can carve anywhere even when power is not available! It has a speed range of 3,000 - 30,000 RPM. It features a powerful and rechargeable Li-Ion battery pack. The tool may be operated by battery or from a wall charger. The tool will run 5 to 7 hours on a single charge. May be used in either a forward or reverse direction, and has a variable speed control. 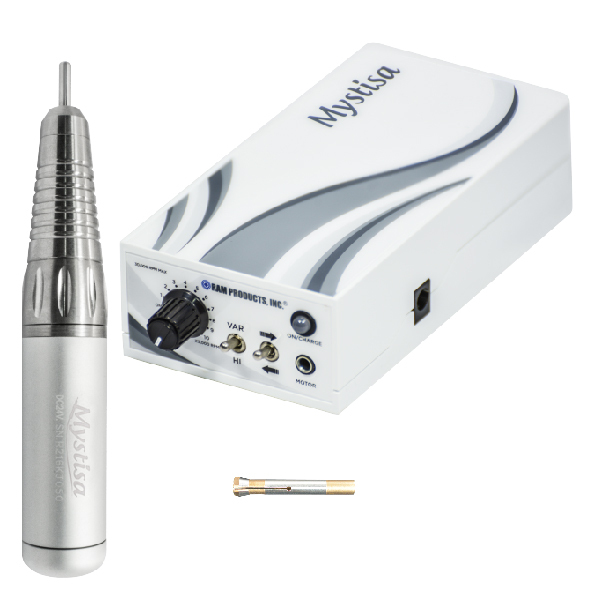 The Mystisa handpiece has a high torque motor in the handpiece, and the handpiece has a quick release twist ring for easy bur changes. The handpiece has a sealed precision motor to eliminate dust, and has an extended nose tip for safety and comfort. The lightweight motor case has a slim, streamlined design for improved grip. The handpiece cord is straight and flexible (not a coiled cord). Even though this tool runs at a slightly slower RPM, it has a surprising amount of power, equaling that of most desktop carvers. The leather pouch has a clip to fasten the tool to your belt, leaving the switches exposed for easy use. The nylon carry case holds everything neatly when not in use. $360 INCLUDES shipping within the continental US. *Note: On direct comparison, I found that this carver has a lot more power than the Foredom portable carver. This carver is a budget minded option that has more power than machines selling to the nail industry at similar prices. It is the lowest priced option that includes a digital display. The control box case has 7 slots of burs, and comes with a holster for the handpiece (when you install it on the box it can be rotated to the angle you prefer). The control box has aswitch to operate the tool in forward or reverse, and an optional foot pedal may be used if desired. A switch allows the tool to operate at either 110 or 230v currents. A rotary dial operates the variable speed, and the speed is indicated on the digital display. The Optimus handpiece has a quick release twist ring for easy bur changes. The handpiece has improved dust seal protection to eliminate dust and heavy duty front bearings. The handpiece has a slim design for improved grip. The soft and flexible handpiece cord is coiled. $199 INCLUDES shipping within the continental US. This carver is a workhorse that has a lot of power and a brushless handpiece. It costs a bit more than some other carvers, but is still priced far lower than comparable units from other companies. If you carve a lot, or use larger burs, this one will perform better. The control box has a state of the art microprocessor chip for programming of speed control, overload and safety. It includes a memory feature that remembers the last user setting before the main power was turned off. The controller also has automatic detection of heat, using thermal sensors to shut down the unit if necessary to prevent damage. The display window will flash an alert; the unit will stop and then resume normal operation after cooling. 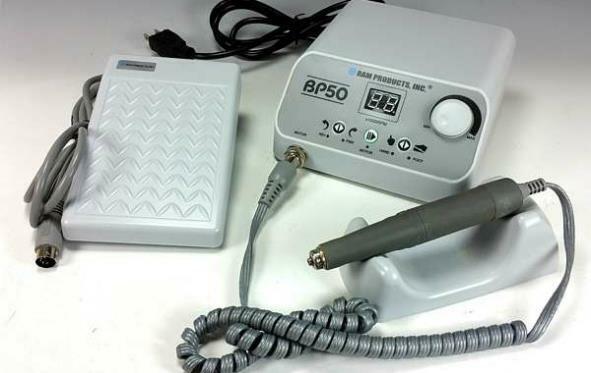 The BP50 Slim handpiece is brushless and high quality. It has a quick release twist ring for easy bur changes. The handpiece has improved dust seal protection to eliminate dust and heavy duty front bearings. The handpiece has a slim design for improved grip. The soft and flexible handpiece cord is coiled. This handpiece is very quiet in operation! $415 INCLUDES shipping within the continental US.